Just when you thought Sylvester Stallone (aka Rocky Balboa) was done, he hits you with a patriotic sucker punch to the jaw, shell shocking you to the fact that Rocky is never done, ever! That is the news today as Sly Stallone announced that Rocky Balboa will face off against longtime Russian nemesis (who’s actually Swedish in real life) Ivan Drago, played by Dolph Lundgren. Either that or at the very least give him a punch for old times sake. All of this may occur in the continuing adventures of Rocky, now under a new title, Creed, which focuses on Adonis Creed, the son of Apollo Creed who died in the ring in Rocky’s arms after taking a colossal beating from Ivan Drago. In these new films, Rocky Balboa takes the place of Mickey as the boxing coach and mentor of the young son of Apollo. Of course, we all remember the impressive bout in the Hollywood classic Rocky IV film from 1985, where Balboa met the iron fisted Russian Ivan Drago, who gave him the fight of his life, don’t you? If not, let’s rewind and see this epic Hollywood boxing match, the brainchild of the very talented and often underestimated Sylvester Stallone, shall we? How about those sound effects? Just perfect, watch! Of course, Rocky won in the end… wouldn’t be right if he didn’t. Anyway, so rumour has it that Creed 2 (which is currently in production as we speak) will see Adonis Creed face off against Drago’s son, but Sly Stallone has hinted that he will get one last punch in on Drago, much to the joy of nostalgic Rocky fans everywhere. So, the question remains, as Rocky will be in Adonis’s corner, and Ivan Drago will be in his son’s corner, we’ve yet to find out who will play as Drago’s son. Will it be Dolph’s real life brother? His real life son? Some new unknown Swedish looking Russian guy? He’d have to be blonde in the very least, otherwise it just wouldn’t fit the bill, would it? The war is on then? Cue the synthesiser music and hum the eye of the tiger to yourself, because this sh*t is about to go down in Creed 2. Adonis Creed, played by Michael B Jordan, could face Drago’s son, and given that his father killed his father in the ring, it’s sure to be a bloody match up. Plus the Hollywood infatuation of U.S.A. vs. Russia can continue, and we’re sure that CNN will like this very much probably. Dolph Lundgren is now at 59-years of age, and would surely beat the pint-sized Sylvester Stallone to death if the Rocky story was a lot more realistic, but this is Hollywood, and nobody does it better in boxing films than Sly Stallone. We think it would be even better if in Creed 2, it saw a real fight between Rocky and Drago in the ring and not just the son of Creed and son of Drago fighting, since in this day and age where crazy fights like Mayweather vs. McGregor and (the hopeful eventual fight between) John “Bones” Jones vs. Brock Lesnar can happen, why not have Rocky Balboa and Ivan Drago duke it out just one last time? Wow again! 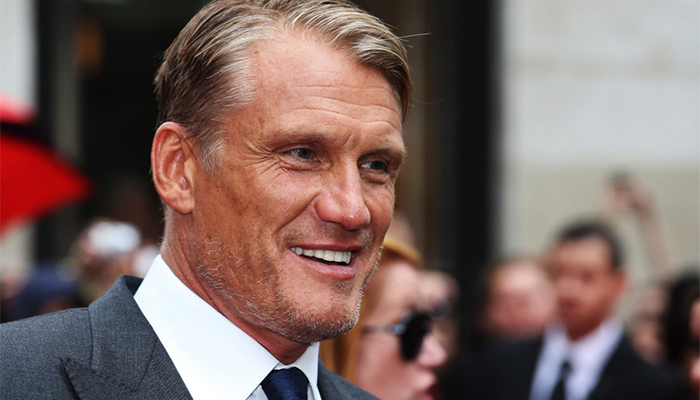 What that tells you is don’t ask a Swede and/or Dolph Lundgren to punch you, ever, as the Viking-strength would most likely kill you. Especially if it’s Ivan Drago doing the punching. So, will Sly Stallone get to do a real punch in Creed 2 in some back alley? Will they do a full blown rematch? Only time will tell. You can’t keep a good man like Rocky down, so we await the news of this scene to be everything that it would be. We love Sly Stallone as well as Dolph Lundgren, so this is going to be a real treat. Sly Stallone is a silent patriot, so would we expect anything less from a man that made a fortune wearing red-gloves and stars and stripes boxer shorts. APOLLO AND ROCKY NOW, WHAT A BOND THEY HAD!! Dolph Lundgren’s training video for Creed 2 shows things are gonna get really serious in the movie, fingers crossed. Can’t wait for Creed 2 to come out.